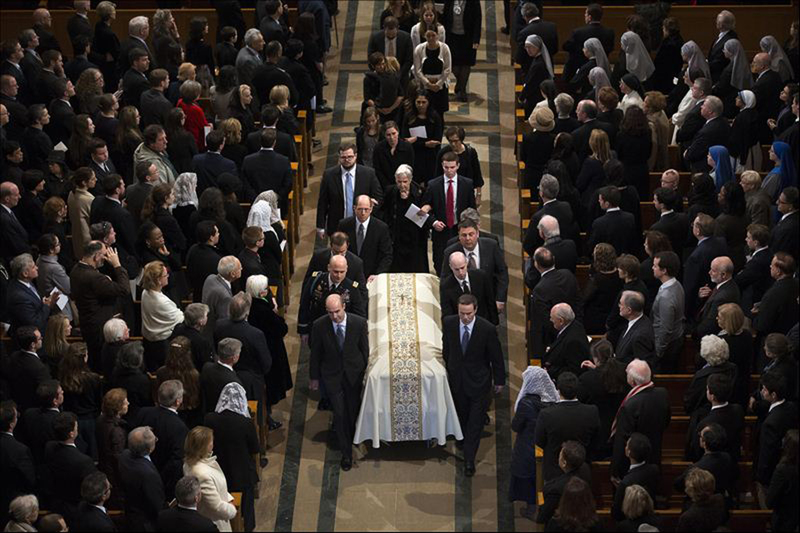 WASHINGTON -- In a hallowed place where popes have prayed and pilgrims have flocked, Washington is capping two days of official mourning for Antonin Scalia with a funeral Mass for the late Supreme Court justice. One of Scalia's nine children, the Rev. Paul Scalia, led the Mass on Saturday at the nation's largest Roman Catholic church, the Basilica of the National Shrine of the Immaculate Conception. It can hold at least 3,500 people. Paul Scalia, a Catholic priest serving the diocese of Arlington, Virginia, delivered the homily as politicians and power-brokers, and friends and family joined in honoring one of the country's most influential conservatives. In highly personal remarks, the younger Scalia has recalled his father's devotion to God and country. But he has said that most important to him and his eight siblings was the love his father showed them. Mixing humor into the homily, the younger Scalia has said his father sometimes forgot their names or mixed them up but he excused him because there were nine of them. He recalled how his father reacted once after accidentally standing in his son's confessional line. The justice said: "'Like heck if I'm confessing to you.'" Paul Scalia joked that "the Roman collar was not a shield against his criticism." Antonin Scalia: "An evangelist for originalism"
Among those who attended the Mass was Vice President Joe Biden, along with the eight Supreme Court justices. President Barack Obama and first lady Michelle Obama were among the more than 6,000 people who paid tribute to Scalia at the Supreme Court on Friday. Scalia's flag-draped casket rested on a funeral bier first used after President Abraham Lincoln's assassination. White House spokesman Josh Earnest pointed to Biden's personal relationship with Scalia's family and said Obama's decision about the Mass was a "respectful arrangement" that took into account his large security detail. Scalia's casket remained at the Supreme Court until early Saturday. In a court tradition, groups of his former law clerks took turns standing vigil. GOP presidential hopeful Ted Cruz planned to interrupt his campaign ahead of Saturday's South Carolina primary to attend the Mass. The Texas senator has been among those urging the Senate not to consider replacing Scalia until after the November election. Obama has insisted that he will nominee a successor. Leonard Leo, executive director of the Federalist Society, a conservative legal group, read a passage from the Old Testament, while Justice Clarence Thomas read from the New Testament. Only one of Supreme Court Justice Antonin Scalia's nine children spoke publicly at his funeral Mass on Saturday, but others have spoken and written about their father this week. Scalia's son Christopher wrote in a remembrance in The Washington Post on Saturday that his father loved opera, classical music and the Yankees. He recalled what would happen to anyone who said "um" at dinner. His dad would "lead a chorus of 'ummmmmmms' to spotlight this oratorical shortcoming." Scalia's oldest son, Eugene, said on conservative commentator Laura Ingraham's radio show earlier this week that his father "loved the court" and the court's work. He also addressed conspiracy theories that his father did not die of natural causes, calling them a "hurtful distraction."